kt literary » Blog Archive » NY Public Library adds THE WEIGHT OF ZERO to Best List!! A huge round of congratulations to debut author Karen Fortunati whose THE WEIGHT OF ZERO made the prestigious New York Public Library Best Books for Kids List!! 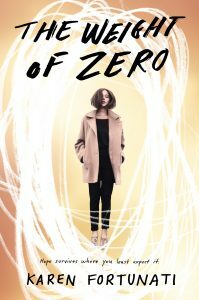 THE WEIGHT OF ZERO is a hopeful look at mental health care and a powerfully moving story of one young woman’s struggle with mental illness and the stigma of treatment.